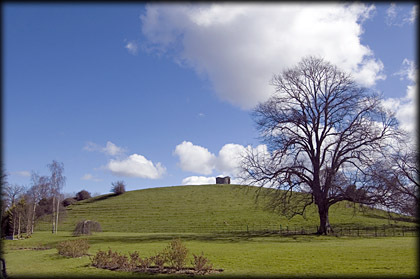 The motte at Castleknock was made from a natural hillock situated to the west of St Vincent's College. Standing at about 19 metres high, the motte is, like most mottes in Ireland, now covered with trees, on the top of it is the remains of a Norman Castle, the western wall of the keep is all that remains, but the bailey in this case is an odd shaped enclosure on top of the motte with an arched gateway still visible, from the keep. The hillock had two large trenches dug into it, the upper fosse is about 7 metres from the top and the lower fosse is about four metres deep on the northern side. 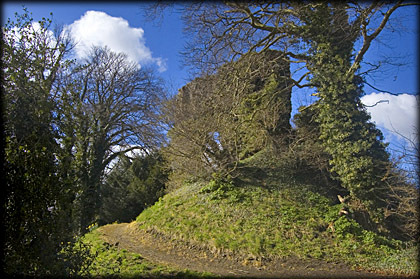 Pictured below is another hill east of the college with the remains of an eighteenth century tower, thought to have been part of an observatory. This was known as Windmill Hill and is said to be the site of an earlier windmill. Folklore: The hill at Castleknock is rich in legend and was at one time known as the Druids mound, it was also known as the 'Fort of Cnucha' and is mentioned in the annals of the four masters. The name Cnucha is also associated with the foster-mother of Conn of the Hundred battles. 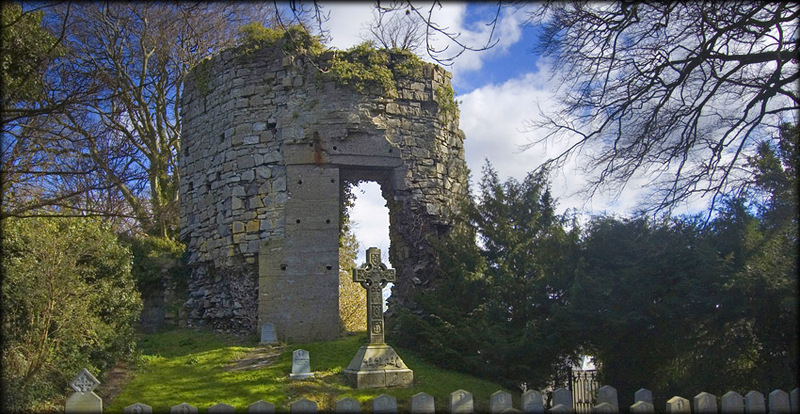 It is said she lived here and was buried in the centre of the hill. Cnucha was known also a a royal seat second only to Tara. A battle took place here in 190 A.D. when Comhal leader of the fianna of Leinster was killed at the hand of Goll Mac Morna leader of the men of Connacht. Traditionally windmill hill is believed to be Comhal's tumulus. Situated: From the City head west along the quays, heading for the Phoenix Park, drive past the park entrance towards Chapelizod, then drive through the village and up Knockmaroon hill. Straight through the crossroads at the traffic lights. The college entrance is straight in front of you at the next traffic lights. Please ask for permission.